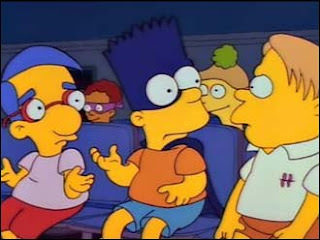 I know this blog is supposed to be about movies, but as you may have guessed from my pseudonym and by the references to the show in my film reviews, I'm a bit of a Simpsons fan. Because of that, I thought I'd branch out away from the cinema into the world of television, with a list of my top 10 favourite Simpsons episodes. I should point out that although I've seen most of the episodes in the first ten or so series many times, I kind of gave up on the show after the jockey elves fiasco (Saddlesore Galatica), so I've hardly seen any of the episodes from around season 15 onwards. Accordingly, this list is dominated by episodes from the classic era (which I would classify as running from Seasons 2 - 8). Obviously, this is a personal list and the Simpsons is a show with something like 100 instalments that can rightly be regarded as absolute classics. Choosing an all time top 10 was very difficult - it's kind of like trying to choose a favourite child. As with my horror movies list, there were many fine examples which just missed the cut - including the likes of Homer at the Bat, Mr. Plow, Marge vs. the Monorail, Duffless, Last Exit to Springfield, Lisa's Rival, Bart sells his Soul, Summer of 4 ft. 2 and You Only Move Twice. Some Simpsons fans have queried whether the second season belongs to the 'Classic Era' of the Simpsons, but for me, there can be no question about it. This is a fine example of that breakthrough season, in which Bart, Milhouse and Martin Prince pool their resources to purchase a rare and valuable issue of Radioactive Man - but an inability to share leads to disaster. The episode is notable for featuring the first appearance of Comic Book Guy and I particularly love the part where Bart is forced to undertake a series of painful chores for elderly neighbour. "Bart: you know what I think? I think Casper is the ghost of Richie Rich. Lisa: Perhaps he realized how hollow the pursuit of money really is and took his own life." Episodes in which Homer gets a new job have become a bit of a cliche on the show, particularly in recent years, but it's been far rarer for Marge to seek employment outside of the confines of the Simpson house. That's a shame really, since there have been a number of excellent episodes in which she does just that - including Marge Gets a Job, The Twisted World of Marge Simpson and The PTA Disbands. For me, though, this is the pick of the bunch - Marge joins the illustrious ranks of the Springfield PD, and fights the mockery of her incompetent colleagues to take down a counterfeit jeans racket, operating out of the Simpsons' carhole. 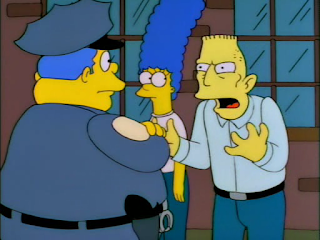 "Chief Wiggum: All right, you scrawny beanpoles: becoming a cop is not something that happens overnight. It takes one solid weekend of training to get that badge. Agitated Man: Forget about the badge! When do we get the freakin' guns?! Agitated Man: I've had it up to here with your 'rules'!" "Chief Wiggum: Simpson, seeing how this is your first day, you're inexperienced and vulnerable - your beat is Junkyville and Bumtown." Homer Simpson has always been a tad on the stout side, but this is the episode in which he intentionally gains weight in order to qualify for hyper-obesity, and gets to live the sweet, sweet life of a lardo on workman's comp. However, he finds that being a king sized man brings new problems to solve - you may be freed from the confines of wearing trousers, but do you wear a cape, a poncho or a mumu? Is it worth the indignity of being thrown out of the cinema in return for a garbage bag full of popcorn? Is it safe to leave your workstation in the care of a plastic drinking bird toy? (The answers are mumu, no and no). "Operator: The fingers you have used to dial are too fat. To obtain a special dialling wand, please mash the keypad with your palm now." "Dr Nick Riviera: And remember, if you're not sure about something, rub it against a piece of paper. If the paper turns clear, it's your window to weight gain." Patty and Selma started off life as one note characters - the grumpy sisters in law who make Homer's life as miserable as possible. However, as the Simpsons started filling in the details of its wonderful cast of supporting players, we got to know much more about the rather sad lives of the Bouvier sisters. Selma in particular is a tragic figure - as Marge puts it in Principal Charming: "It's Patty who chose a life of celibacy. Selma simply had celibacy thrust upon her." 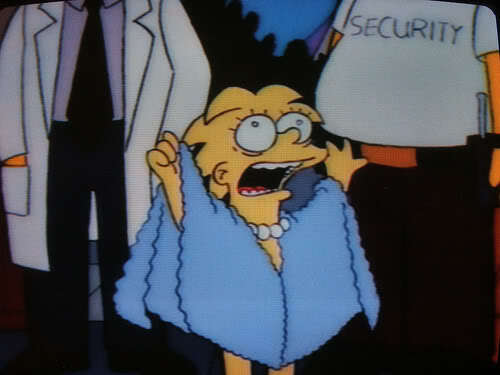 Anyway, for all that, the reason I love this episode so much is Selma's disastrous visit to Duff Gardens with Bart and Lisa, in which Lisa drinks some dirty water from one of the rides as a dare and has a memorable freak out, while Bart gets to wear Duff's patented Beer Goggles, and sees the world through the eyes of a drunk. We also get to encounter the seven Duffs ( Sleazy, Queasy, Surly, Edgy, Tipsy, Dizzy, and Remorseful) - with Surly being a particular favourite of mine ("Surly only looks out for one guy - Surly"). Having been subject to a day of chaos with the Simpson kids, Selma decides she might be happier after all with her pet iguana, Jub Jub. "Announcer: Come to Duff Gardens, where roaming gangs aren't a problem any more!" Employee: Oh, I'm not a doctor"
This may be something of a bold claim to make about an episode of a TV show, but I'm pretty sure this one actually saved my life. Last year, I was in on holiday in Italy, confined to my hotel room after suffering from a truly horrendous stomach bug, with nothing on TV that I could understand but the BBC World News service. 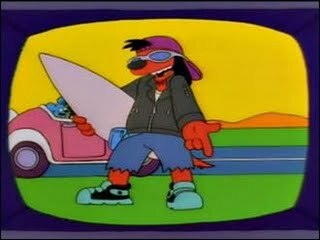 Fortunately, like a ray of light in a stormy sky, I happened to flick through the channels and discovered that the Itchy, Scratchy & Poochie Show was on - and in English, too! Seeing Homer's attempts to portray an unpopular cartoon dog with 'attitude' was just the tonic I needed to overcome my sickness. It's an episode which is both laugh out loud funny in its own right, and also an interesting insight into the showrunners' feelings about some of the show's more obsessive fans. "Ned Flanders: Homer, I can honestly say that was the best episode of 'Impy & Chimpy' I've ever seen!" 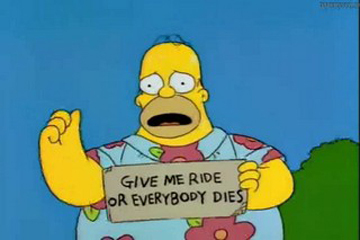 "Homer: Let me ask you a question. Why would a man whose shirt says 'Genius at Work' spend all of his time watching a children's cartoon show?"